If you are looking for some effective email marketing services for your business, then you have landed at the right place. This blog is all about email marketing software which offers opt-in form as well that helps you to build email list faster. We all are aware of the fact that email marketing is currently the most leading marketing strategy as it generates faster conversions as compared to any other marketing channels. So, by collecting users details like name, address, emails, and other important information will be a great benefit. Want to know how you could achieve this? A very popular fact exists, which is stated as – Larger Your Email List, More Audience You Get To Target. By recognizing the importance of growing email list, email marketing services have come up with an excellent solution i.e. Email Opt-in Forms. Rather, I should say the framework upon which the entire success of the email marketing campaign is based on – Email List. So, let us quickly explore the opt-in form email marketing services which will assist you in the growth of email contact list without much hassle. For your benefit, we have also got a comparison table which holds important product details. MailGet is an email marketing service that caters some of the advanced services at a cheap and affordable rate. With its features like drag and drop email editor, excellent email deliverability facility, list management options, scheduling drip campaigns, web form embedding, etc. you can easily design and plan robust email campaigns. MailGet incorporates an excellent Embed Web Form feature through which you can build an effective contact list. With this feature, you can create signup forms and subscription forms. In order to include web forms, you just need to generate the code by clicking on the Embed Web Form tab provided in the Settings section. Then copy the generated code and paste it into your website. By default, MailGet subscription form is single opt in. 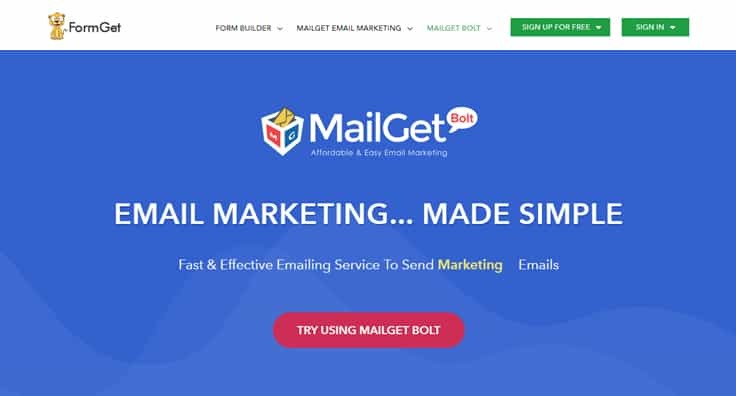 MailGet is a popular software as here you can connect to multiple SMTP services and they have got everything nailed down from High Delivery to Bulk Emailing to Statistics – all of it! It’s hard to think anyone can compete with them in terms of price and services. As its plan starts from $5 for UNLIMITED EMAILS. MailGet serves you with 4 pricing schemes which you can select as per your business need. Starters – Send emails to 5000 subscribers at just $5 per month. Get email builder, 10 monthly campaigns & connect to 1 SMTP server with this plan. Rookie – Rookie plan will cost you only $29/month with which you can send emails to 25,000 subscribers. It will benefit you with other advanced features like automatic follow-ups, email builder, unlimited monthly campaigns, 3 SMTP connections, etc. Pro – The third plan enables you to send emails to 50,000 subscribers in $49 a month. Besides other basic features, you will get these enhanced features like unlimited SMTP connections, SMTP routing, live chat support and more. Advanced – Its advanced plan starts from $79 per month for sending 1,00,000 emails with some amazing features. Subsequently, its highest plan will cost you $672 a month for sending mails to 1,000,000 subscribers. Note:- You can save upto 20% on its yearly billing. MailGet Bolt is a renowned name in the list of best opt-in form email marketing services. It not only lets you create & broadcast professional email newsletter in bulk, but also benefits you with extensive features like subscriber segmentation, autoresponders, Google Analytics integration, inbox preview, personalized tags and a lot more. Additionally, you will get built-in SMTP that cuts down your efforts in setting up an SMTP server manually. 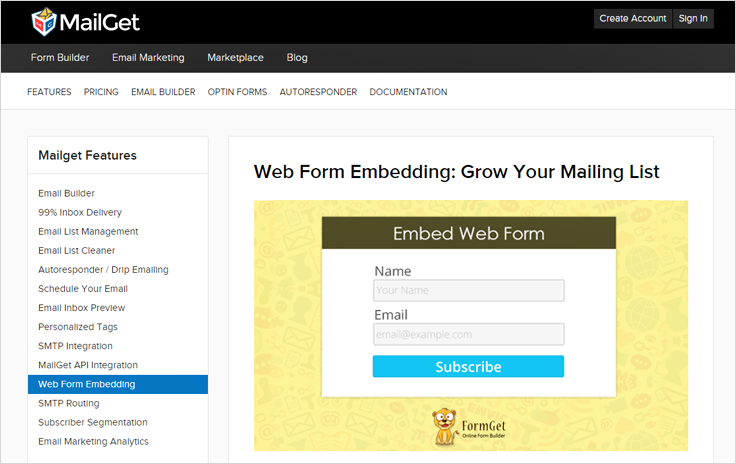 With MailGet Bolt, you can seamlessly create opt-in forms and generate leads tremendously. For doing so, all need to do is, go to the Embed Form Section and fill the required fields. Furthermore, copy the generated code and you are ready to paste it on the high converting places of your site. This email marketing service offers most economic pricing plans where you can also save up to 20% on opting its annual billing scheme. Starters – You can start broadcasting 2,500 emails to the subscribers by spending only $9/month. This starter plan benefits you with basic features like email builder, 10 monthly campaign & custom tags. Rookie – The second plan comes with the price tag of $19/month and lets you send emails to 5,000 subscribers. Moreover, you will get to have other enhanced features along with live chat support. Pro – Buy this plan at just $34 for a month & send emails to 10,000 subscribers. The features list will further prolong with the addition of automatic follow up option. Advanced – This plan consists of 23 sub-plans with varied pricing for the different number of subscribers. The first plan will charge you $49 for sending 15000 emails whereas the last plan is available at $439 to send emails to 2,00,000 subscribers. 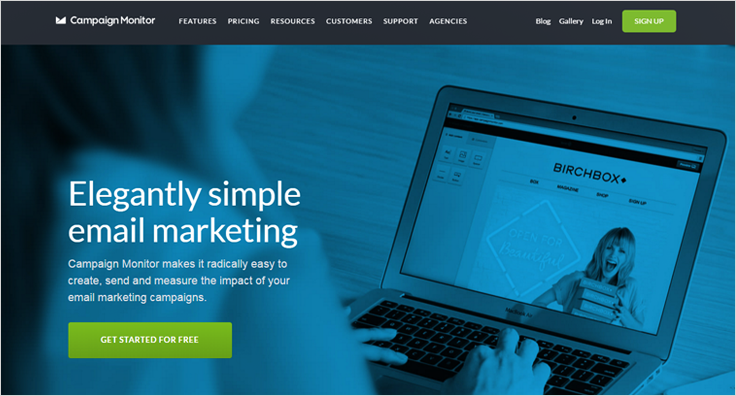 PowerMailer is an email marketing solution that lets you design a professional email newsletter and send them with a few clicks. Other features that PowerMailer includes are list and subscriber management system, sophisticated email tracking and analyzing reporting system, etc. For growing contact list, PowerMailer has also implemented email opt-in form building features with their email marketing service. It provides you to create quickly, launch and manage multiple signup forms. Also, you can manually setup the opt-in mode i.e. whether you require single opt-in or double opt-in signup forms. Gold – Send 2500 emails per month in $13. Gold Plus – Buy this plan for $20 and send 5000 emails in a month. Platinum – Spend $30 for sending 10,000 emails in a month. Platinum Plus – If your marketing campaign needs to send 25,000 emails, you can buy this plan at just $68. Titanium – You can instantly send 50,000 emails by purchasing this plan at just $100. Titanium Plus – This premium plan will cost you only $160 & lets you send 1,00,000 a month. Campaign Monitor, a big name in the field of email marketing services, provides numerous services with which you can build and deliver custom designed emails. In their services, you also find some really amazing features such as integration with the business app, marketing automation, etc. Campaign Monitor also provides email opt-in forms templates, through which you can include signing up forms on your website. For this, you need to go to form editor and select the field that you want in the form. Then click on Get the Code button and copy the generated code. Then paste it to the website where you wish to have the sign-up form. Basic – The first plan will charge you $9 for a month & lets you send 2,500 emails with all the core email marketing features & basic marketing automation. Unlimited – This plan starts with $29 a month for sending unlimited emails. The features will include options like unlimited spam testing, time-zoned sending, inbox preview and more. Premier – With the premier plan you can send unlimited emails at $149/month. Furthermore, you can avail many advanced features like advanced link tracking, template management, basic & advanced marketing automation, send time optimization etc. 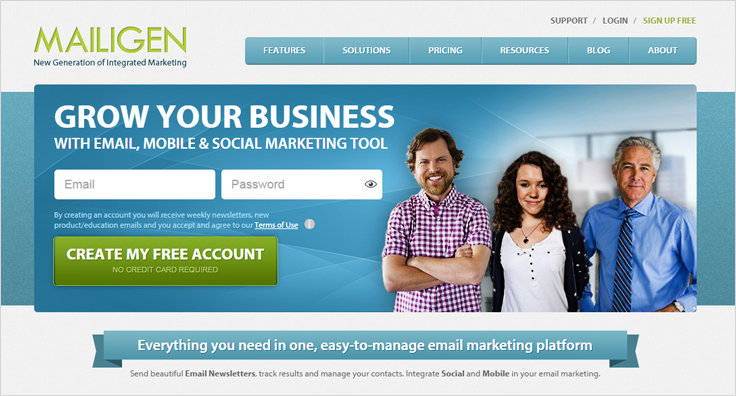 Mailigen services you with an all-in-one marketing platform presenting you with email, mobile, and social marketing tool. Through their email marketing service, you can design and send professional looking emails, track emails and efficiently manipulate contact list. Mailigen includes a WYSIWYG subscription form builder system i.e. a simple but easy to use email opt-in form builder. Through this, you can create subscription forms and paste it into your website. You can make both single opt-in, as well as double opt-in subscription forms. 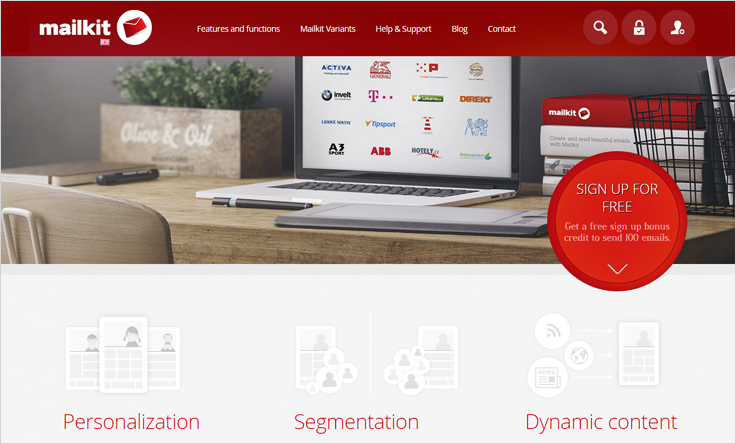 Mailigen has got a wide range of pricing scheme for different number of subscribers with features like RSS & XML based campaigns, campaign A/B split testing, behavior-based automation series, Google Analytivs integrations and many more. Note:- You can get the details of other cost estimations through the sales team. Also, you can opt its “Pay As You Go” plan and pay only for the required number of sent emails by purchasing email credits. 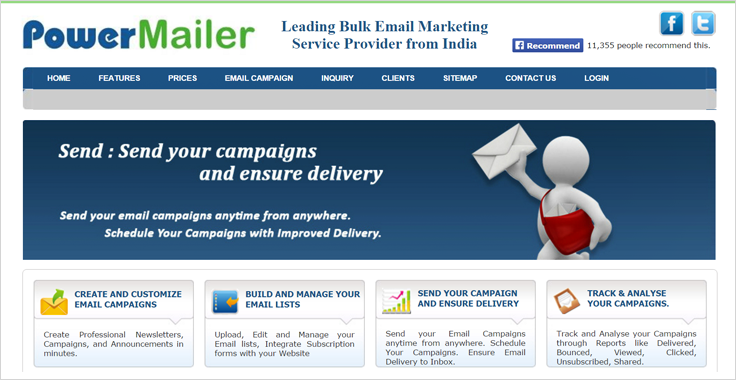 MailKit is one of the most comprehensive and reliable email marketing services. With its excellent marketing functions like you can create an email newsletter, do content personalization, manage large contact lists, get a detailed report of every email campaign, create opt-in email lists form etc. For building the contact list, MailKit also provides you with an email opt-in form code generator. This code generator creates HTML codes that are required to be posted to the website where you want to have the subscription form. When visitors fill up the subscription form, their email addresses automatically get added to the contact list. Get in touch with the sales team to get more details. Call it opt-in forms, subscriber form, newsletter sign up form, custom forms or email web forms, you are going to use them for your business every now and then. Well, I am sure you would be amazed to know about these opt-in form email marketing services to boost your business. The above-listed email marketing software are some of the best ones that are very simple to use and cost-effective.